Jeroen had doubled down on the software developments and developed RGB effects. Of which the Beta released during the last livestream. The public version is planned for the 9th of March. In March, Jeroen will work on dynamic gaming profiles. As a bonus, if it’s stable enough, release the faster keyboard scanning rate of <1ms. It’s in an isolated beta now, ask @fleimi on Discord if you want to help. If you intend to get a Wooting one, then now is your chance. Until the end of March, the Wooting one basic is available for 139.99 instead of 159.99. We want to get more Wooting ones in the hands of users in preparation for our grand 2018 plan. Had you seen our new about us page? 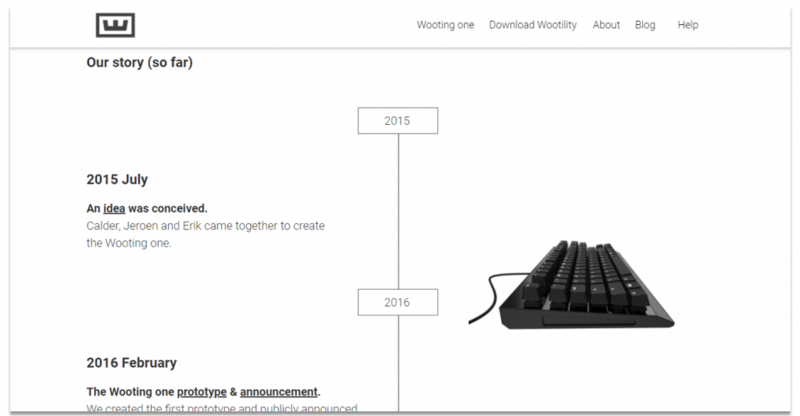 It’s a quick sum-up of who and what Wooting is. Feedback welcome. All three of us were surprised how much fun it is to play with the RGB effects. Thanks to you all for the continuous feature request. This doesn’t mean we’re now all about the disco colors, but the RGB effects definitely opened a door. The RGB beta version released during the last livestream. It’s still very crude, but thanks to the volunteer beta testers for listing all the issues. It speeds up the problem solving for the public release planned for the 9th of March. The Beta version currently includes a total of 10 effects. Furthermore, a major improvement was made to the color palette. It will better reflect the colors from the color picker. We want to give developers access to the RGB effects and RGB LED communication with the keyboard. This will allow more custom effects and RGB interactivity to a next level. You can already live control/view the RGB colors on the Wooting one itself when you change it in the Wootility. We want to give developers (You?) this same access so you can add interactivity based on custom defined actions. This will be part of our open source Wootility release, planned in May. We would give access to it right now if it wasn’t connected to all the other keyboard communication. We want it to have its own isolated communication. To elaborate, imagine a road going from the keyboard (KB) to the PC. All the communication (RGB control, analog output, keyboard output, everything) between the KB and the PC happens on this road. If we want to give access to RGB, we would have to give a developer access to this road. Not a big deal, you’d say, but the problem comes when the developer adds too much traffic to the road and/or interferes with other traffic. The KB will quickly become a bug heaven and create all kinds of issues. Thus, we need to create a separate road from the KB to the PC that only communicates RGB and nothing else. We had already done that for the analog output, that you can access at request. I’ll talk more about open sourcing in the coming months. You’re welcome to contact us if you have an analog or RGB project in mind. This March Jeroen will start working on dynamic gaming profiles. This means the Wooting one profiles change according to the application or game running. Erik will also work on a better UX for managing/loading/viewing the profiles. So it’s easier to swap around and see which profile you’re currently using. As a bonus, Jeroen worked on the keyboard scan rate. Meaning how fast the keyboard scans every single key input. Different from the 1000hz “polling rate”. Which means how often the PC checks the keyboard for input. Right now it’s at a stable 6ms, to avoid any additional issues during launch. While working on the RGB effects, Jeroen was able to pus the scan rate to less than 1ms including the analog signal(!). It’s a big development that I’m excited to see happen. If you’re not sure why or what it even means, Tino will publish a special blog that will go into more details. There’s an isolated beta for the <1ms scan rate, that we need to run a while before pushing it to everyone. It pushes the keyboard to its potential and also exposes it to new issues. We can use your help to test it, otherwise, we can’t make a public release. If you want to pitch in, head over to Discord and ask for @fleimi to get access and instructions. You can follow the planned developments more closely on the roadmap. In the long-term, we need as many as possible people to own an analog keyboard. That’ll give us more leverage towards other companies, and help further analog developments. That’s why during March we’re introducing a special discounted price from 159.99 to 139.99. I hope this will help grow the user-base in preparation for our open-source release and growing focus on selling towards the mass market. Had you seen our new about us page? Probably not, it recently went live. It’s a quick sumup of who and what Wooting is. You’re welcome to leave us feedback. It still needs some more flair, but a snippet of it will also become part of the landing page. Something we should’ve done way back already, because it’s not just about the keyboard. That’s it for now. If you have feedback or questions, you know where to find us. Next Post How can game developers support analog keyboards?